Active expansion of Russian ties with Latin America has generated a need for an annual international forum, which will make it possible to share experience and technologies, and strengthen investment cooperation. The first experience was the conference "Russia - Latin America. Ways of Development and Strengthening of Trade and Economic Relations" in Moscow organized by the International Investment Cooperation Fund. With the support of the Chamber of Commerce of the Russian Federation this format of the meeting was initiated by more than 25 ambassadors of the countries of Latin America and the Caribbean. The conference was attended by Heads of the Presidential Administration of the Russian Federation, Federation Council of the RF Federal Assembly, ambassadors, and numerous representatives of major Russian and foreign companies. The International Investment Cooperation Fund was created when we have just started preparing Asia-Pacific Economic Cooperation Forum (International Summit of APEC) in Russia. Together with representatives of the Ministry of Regional Development, the Fund was engaged in its organization being in charge of searching for investors. Thanks to the experience of interaction with the business community in South Korea, Hong Kong, and a number of other countries, strong business contacts with Asian investors have developed: over 100 companies have expressed their interest and willingness to invest in projects in the Far East. First of all, these were investments in construction of facilities for the APEC summit. This positive experience of cooperation with foreign partners has demonstrated great potential and significant opportunities for attracting foreign investment in Russia, not only from Asia but also from other regions. The Fund is actively involved in investment projects based on public-private partnership and investment in large infrastructure projects both in Russia and abroad - construction and reconstruction of airports, transport and logistics hubs, exhibition centers, housing facilities, and much more. However, the investment conference in Moscow had a different focus. It was about the participation of major Russian companies in the implementation of investment projects in Latin America. The population of Latin America is a total of 600 million people with the aggregate GDP being 6 trillion U.S. dollars in 2012. The countries of Latin America and the Caribbean occupy 15% of the planetary land, accounting for over 30% of the world's fresh water, a strategic resource for the future of the planet. The region has 18% of the world’s proven oil reserves. The Fund encourages local investors to seriously think of the great potential of this region. Entrepreneurs of this region are open to new ideas and cooperation with Russia. For example, there is an investment plan for development of the energy and tourism sectors in the Dominican Republic. Foreign colleagues have turned to Russia with a proposal to build there six power plants fueled by coal and gas and eight hydroelectric power plants, reconstruct a number of oil refinery plants and salt-water port, build high-speed railway and the largest exhibition center. From the point of view of organization of financing, there is a memorandum prepared to attract investment in the Dominican Republic for a total of 10 billion euros. For their part, Dominican partners provide sovereign guarantees of the state. The Fund is actively working to attract investments. One of the priority directions of development of the countries of Latin America today is the diversification of the economy. Together with Russian investments they will be able to use modern technology. The implementation of projects of this scale is of strategic importance and, not least, from the point of view of energy security of the country. The Investment Cooperation Fund is actively working on implementation of large-scale strategic projects between Russia and the countries of Latin America and the Caribbean. We are discussing interesting projects in Guatemala, Uruguay, Honduras, Nicaragua, Cuba, Ecuador, and El Salvador. The largest banks in Europe, Hong Kong, Singapore, and international investment funds invest in these projects. The "cheap money policy" is still in effect in Europe. The refinancing rate set by the European Central Bank is 1%, while interest rates on deposits do not exceed 0.5%. It is natural that European financial institutions are looking for the more attractive investment projects. In this sense, the projects offered by the Investment Cooperation Fund are of great interest. They are profitable, on the one hand, and subject to less risk due to interaction based on the public-private partnership, on the other. The investment volume can be hundreds of billions euros. Development of the power industry is one of the priority areas of economic development in Latin America. In this sense, it is quite logical that the activities of Inter RAO UES and RusHydro OJSC are of great interest offering quality services at a low price compared to world prices. Competent implementation of large-scale projects in the fuel and energy sector is impossible without the creation of powerful logistics centers and construction or reconstruction of ports. This area is also the point of interest of the Fund. The similarity of the Russian mentality to this of Latin Americans makes it possible for us to find a common language. Latin America and the Caribbean have loyal legislation with respect to foreign investors, especially to these who wish to purchase real estate. Almost all the Caribbean countries have many islands, which are not populated. The government is ready to consider the long-term lease of these islands at the more than reasonable prices for the construction of hotel complexes and creation of appropriate infrastructure, while observing all the rules and the interests of investors. We see it quite often that foreign companies are trying to find investors alone, organizing numerous meetings with entrepreneurs and representatives of local authorities. As practice shows, this approach does not bring the desired results. The Fund’s activities are aimed at solving complex problems of establishment and strengthening of partnership between Russia and Latin American countries. In this sense, the conference "Russia - Latin America. 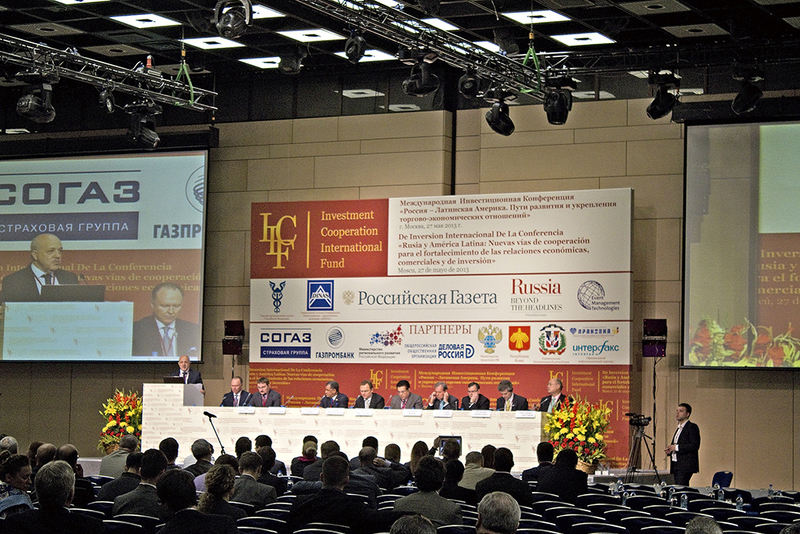 Ways of Development and Strengthening of Trade and Economic Relations" and the 1st International Investment Forum "Russia - Latin America" to be held in Moscow 24-26 March 2014 will be a real opportunity to present investment projects and sign contracts and agreements. The most promising industries, in which foreign colleagues are successful, include agriculture – from finished products to harvesting equipment. We can talk about the great potential in the development of relationships with Brazil, one of the ten economic giants of the world. There are prospects of strengthening ties with Venezuela, Colombia, Peru, and Chile, the countries significantly contributing to the economic image of the region. According to the organizers, the forum "Russia - Latin America 2014" may become the venue of signing agreements for more than 50 billion euros. The Fund would like to express its gratitude to the VIGIL magazine for the opportunity to invite all the readers to take part in the International Investment Forum "Russia - Latin America" that will take place in Moscow on 24-26 March 2014.